Inland from the waterfront, country lanes wind their way through an ever changing landscape of multi shades of green, splashed with the bright colours of wild flowers. Pale green are the vines that curl around granite pillars, whilst the darker green cabbages or potatoes occupy the space below. To the north a turn in the road reveals the long majestic sands of A Lanzada, where dunes and open grassland form the backdrop, with not a building in sight. Beyond, a bridge now joins the mainland to the idyllic island of A Toxa, home to the fishing town of O Grove and famed for its 'conchas' or shellfish, which are served in their shells and combined with a delicious mixture of finely chopped onion and pepper. Above higgledy-piggledy villages of soft stone rise densely forested slopes of oak and chestnut, eventually stopping to give way to the wild stretches of moorland that dominate the upper heights. Down below, well tended fields are dotted with wigwam shaped corn stacks and stone built 'horreos' stand on tall stilts to protect the harvested crop. In the valleys, arched Romanesque bridges cross lush banked streams of salmon and trout with their limpid bathing pools, whilst cowbells echo from the hillside. The genuine warmth and generosity of its inhabitants adds to the appeal of this beautiful region; 'Aquí estás en tu casa' (here you always have a home) and 'Yo no tengo prisa' (I've got all the time in the world for you) were phrases that were frequently uttered by our delightful hosts as they enthusiastically introduced us to the land of which they are so proud. 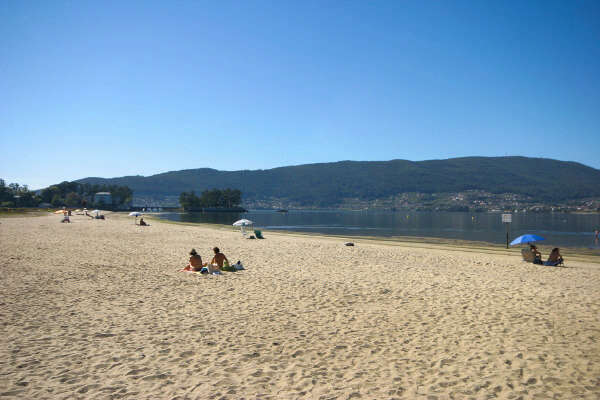 The Rías Baixas enjoys a gentle climate, with summer temperatures ranging between 25 and 30°C and dropping only slightly in June and September. Choose from the flavourful 'caldo', meat stock combined with vegetables and potatoes and often presented in an earthenware bowl, the roasted ham, typically served with a sauce,or the tender roast beef. 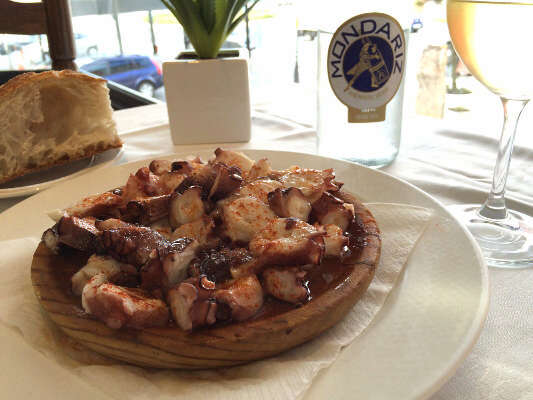 'Empanada de berberecho', a pie of smooth, light pastry filled with cockles, seafood croquettes, 'pulpo a la gallega', octopus in paprika and olive oil, and a mouth-watering range of freshly caught fried fish are some of the many seafood options available. A perfect accompaniment is the deliciously fruity white Albariño wine, or the lighter Ribeiro, both locally produced. Regarded as the third most sacred city after Jerusalem and Rome, Santiago de Compostela is a focal point for hundreds of pilgrims. The years in which the saint's day falls on a Sunday are designated 'Holy Years'. The opening of the Saints Door of the cathedral at the end of the previous year marks the start of a year of celebrations, when the city becomes an even more important holy site. Galicia is easily accessible. By air, flights are available to Santiago de Compostela from Stansted with Ryanair and from Dublin with Aer Lingus, whilst Vueling fly from London to Vigo and A Coruña. Alternatively, flights are available to the Portuguese city of Porto from Heathrow and Gatwick with Air Portugal, from Gatwick with easyJet and from Stansted, Gatwick, Bristol, Liverpool and Dublin with Ryanair. From Porto, a drive of 2-2½ hours will bring you to your destination. By car, Brittany Ferries provides sailings from Plymouth and Portsmouth to Santander and from Portsmouth to Bilbao, with both Spanish ports being within a day's drive of the area. 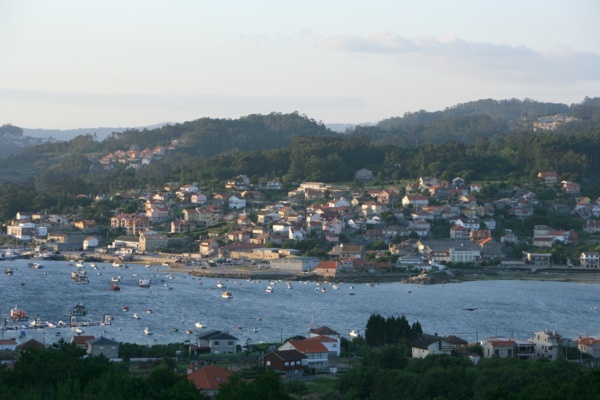 A Guarda is a traditional Galician fishing town with a rich history. Its most famous attraction must be the majestic Mount Santa Tecla which, with an elevation of 341 metres, rewards visitors with spectacular views of the River Minho, Spain, Portugal and the Atlantic Ocean. The summit is also home to a fascinating former Celtic settlement with restored houses, a museum and petroglyphs dating to 2000 years before the Celtic occupation of the site. Back down in the town itself, the atmospheric port is backed by an array of excellent restaurants serving the day’s catch, surely the perfect place to try the lobster for which the town is famous. 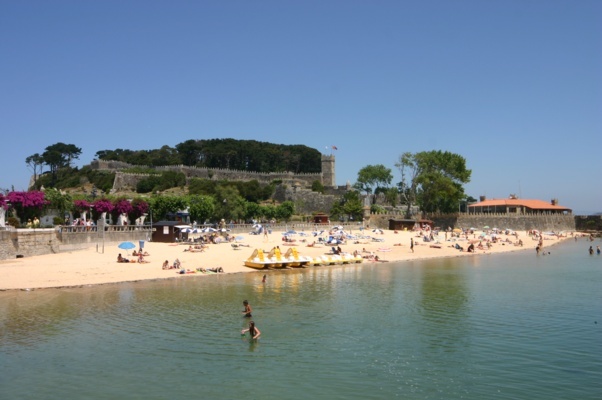 Furthermore, A Guarda boasts some quite magnificent beaches which sit on the mouth of the River Minho with soft white sands, calm shallow waters and lovely views across the water to Portugal and out to sea. 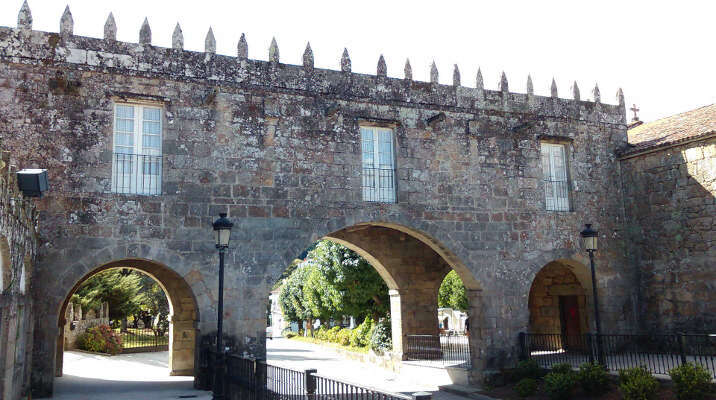 If those views should catch your eye, you can make use of the handy ferry service which connects A Guarda to the historic Portuguese town of Caminha across the river. Whilst most famous for its stunning 12th century monastery which sits perched above the waves looking out to sea, Oia boasts some quite spectacular scenery. Nature lovers are in paradise here with the nearby Serra dá Groba being home to a rich variety of flora and fauna as well as mountain streams, small lakes and waterfalls. The area is fantastic for walking and as well as offering stunning views of the surrounding countryside and the Atlantic Ocean, explorers are rewarded with opportunities to discover Bronze Age petroglyphs, Iron Age remains and former Celtic settlements, all reminders of Oia’s rich and fascinating history. In Oia itself you’ll find two good quality restaurants and you’ll also find a good number of excellent eateries dotted along the dramatic coastline which is part of the coastal route of the world-famous Camino de Santiago. 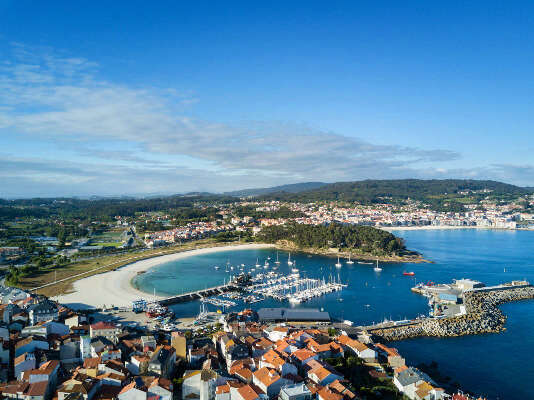 Situated on a beautiful and dramatic stretch of coastline, you’ll find the attractive and historic town of Baiona to the north and the traditional fishing town of A Guarda to the south. Home to some of the most emblematic beaches of the Rías Baixas, Nigrán enjoys a privileged coastal location between Vigo and Baiona. Due to its enviable position, it is not surprising to learn that the area has been inhabited for thousands of years, with the economy of the local people having always been intrinsically linked to the sea. It is this connection to the sea that arguably makes Nigrán so appealing with numerous sandy beaches, many with stunning views across the water to the world famous Cies Islands, an abundance of fresh fish and seafood served up in friendly and welcoming restaurants and a wide range of water based activities on offer such as kayaking, sailing and surfing. Praia de Patos is renowned as one of the region’s best surf beaches for all levels of ability and there is an excellent surf school based on the beach itself. Heading slightly inland will give you chance to discover several ‘Pazos’ (noble houses) which are reminders of the economic rewards that a prosperous period of expansion in the Middle Ages brought to the area through the growth of important commercial centres such as that at A Ramallosa. Medieval Baiona overlooks the open sea across to the Cies Islands. Its old town, declared of historical interest in 1993, is made up of stone and granite buildings, narrow streets and quaint squares. It is overflowing with tapas bars and restaurants serving freshly caught seafood such as clams, octopus and mussels, succulent locally sourced beef, cheeses and homemade empanada, all washed down with local wine and liqueurs. The medieval Castillo de Monterreal, now the Parador, stands at one end of the promenade which stretches over 4 kilometres, past the marina, yacht club and beyond to the open stretches of sandy beach. In Baiona Port visitors can see a replica of La Pinta, one of Columbus’ ships that made the journey to the New World. Situated between the Minho River and the Atlantic Ocean, O Rosal is best known for its lush green countryside dotted with vineyards from which the delicious local Albariño wine is produced. The region is perfect for nature lovers with numerous opportunities for long walks to discover hidden waterfalls and natural swimming pools and bird watchers will be in paradise with the area being home to a great variety of species which are attracted to diverse habitats, from forest-covered hills to the tidal freshwater wetlands of the River Minho. No visit to the region would be complete without visiting ‘Os Muiños do Folón and Picón’, a series of 60 historic mills that wind their way uphill through beautiful countryside, offering a number of enticing walking routes. Life in the town of O Rosal itself centres around the picturesque plaza which is lined with bars, restaurants and small shops. You’ll find all amenities here and a well-stocked supermarket will ensure you have everything you need. As well as being ideally situated to explore this beautiful, most southerly part of Galicia, Northern Portugal lies just across the water and gives you the chance to experience two fascinating cultures in one trip. Marín is situated on the south shore of the beautiful Ría de Pontevedra. Boasting sandy beaches with crystalline waters and lush green hillsides, the colours here will astound you. 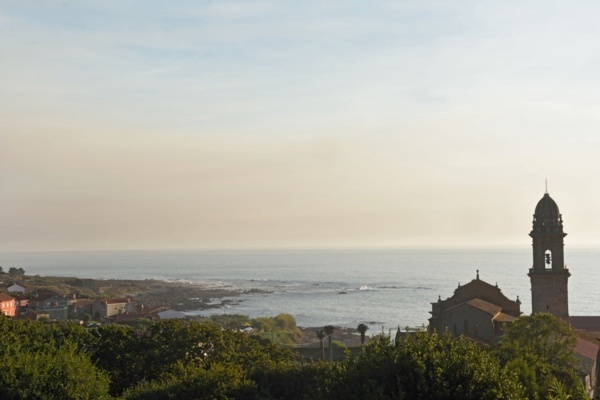 With the sea and hills all around you, the area is perfect for enjoying a wide range of outdoor activities such as hiking, cycling, horse riding, sailing and kayaking. The coastline around Marín is the ideal place to enjoy excellent fish and seafood fresh straight from the Ría and it is this quality and freshness that has made Galician seafood world renowned. In Marín itself you’ll find a wide range of shops, supermarkets, bars and restaurants. 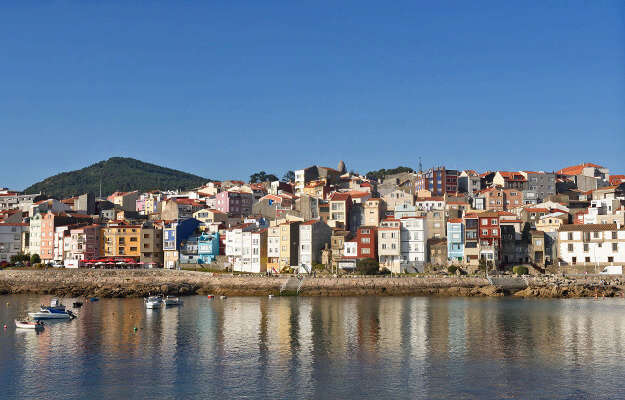 It is a buzzy town with an infectious atmosphere, the home of the Spanish naval academy and the birthplace of Davide Salvado, arguably the most important voice in modern Galician folk music. 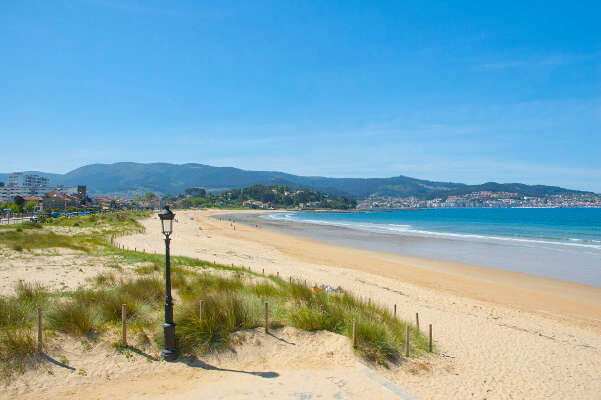 On the eastern shore of the Ría de Vigo, between Redondela and Arcade, the pretty waterfront village of Cesantes looks out from its sandy beach and typical summer ‘chiringuitos’ (beach bars) onto an enticing panorama of shimmering, sheltered waters. It is here, in the fjord-like inlet that winds its way inland from the sea, that some of the world’s finest seafood is produced and just a short drive north of Cesantes, daily catches, mainly of oyster and mussel, are hauled onto the shores of the ‘seafood capital’ of Arcade. Bordered on almost all sides by sea and golden beaches, the district of O Grove is famed for its seafood, its idyllic and beautifully unspoilt coastline and its rich maritime history. 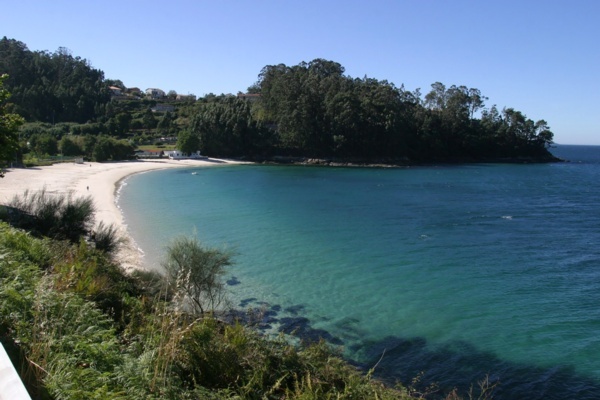 Situated on the western tip of the peninsula that weaves between the waters of the ‘rías’ of Pontevedra and Arousa and linked to the mainland by a strip of land fringed by the impressively long sweep of sands of La Lanzada, it has become one of the most highly sought after destinations of Galicia’s Rías Baixas. A short drive from O Grove will reveal some of the many beauty spots to be found along this picturesque peninsula: the golden sands of Playa de Pipas, the majestic dune backed bay of La Lanzada and the pretty island of La Toja being just a few. Situated in the lush Val Miñor valley, Gondomar is a town and municipality where you can enjoy both idyllic Galician countryside and easy access to the coast. On long walks through the hills and valleys you’ll find petroglyphs, dolmens and the remains of Celtic settlements; all clear reminders of the ancient history of this charming area. As well as country hikes and fabulous mountain views you will no doubt spend time on the fabulous sandy beaches in nearby Nigrán. Gondomar itself is a small working town with a traditional, historic centre filled with small shops, bars, cafes and restaurants where you get a real taste for life in a typical Galician town. 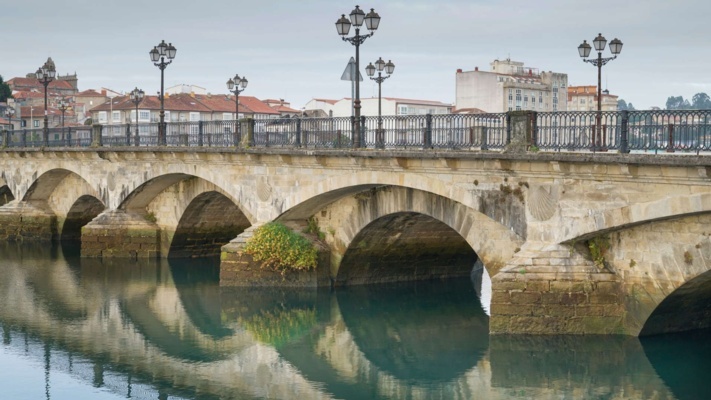 Strategically, Gondomar is conveniently placed to explore this fascinating region with Baiona, Vigo and Tui all being just a short drive away. In Cangas there are supermarkets and a wider variety of shops and amenities as well as a port from which you can get a boat across to the fascinating city of Vigo or out to the world famous Cies Islands, home to Praia de Rodas which was once named the world’s best beach by the Guardian newspaper. Portonovo is a fishing village with an attractive port area backed by a wide range of bars and restaurants. In the port area you’ll also find Baltar beach, one of three sandy blue flag beaches that belong to the village. It is well worth a leisurely walk around the port area to see all the boats and the fisherman landing their daily catch and depending on the time of day, why not stop off in the Lonxa and enjoy a coffee or a beer with them. 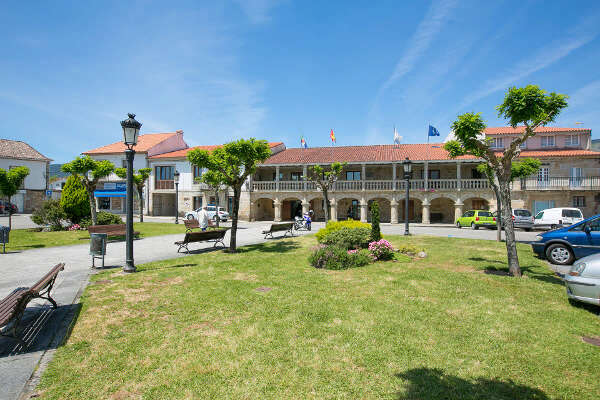 Neighbouring the popular seaside resort of Sanxenxo and equidistant between the historic city of Pontevedra and the area of outstanding natural beauty which is O Grove, Portonovo is ideally situated to make the most of this stunning area of the Rías Baixas. Vilacoba is a rural hamlet situated in the heart of the Galician countryside. Perfect for long walks and exploring the hills and forests which are the settings for so many local myths and legends, you are still within easy reach of the fascinating city of Pontevedra, beautiful sandy beaches and the stunning O Grove peninsula. In the neighbouring village of A Chan, you’ll find a small bar, a small shop and the famous ‘Santuario de A Virxe dos Milagres de Amil’ church which plays host to one of the region’s most renowned and traditional fiestas in September each year. A range of shops and restaurants can be found in nearby Moraña however; you’ll find some of the best restaurants off the beaten track where you can enjoy some delicious home-cooked cuisine. 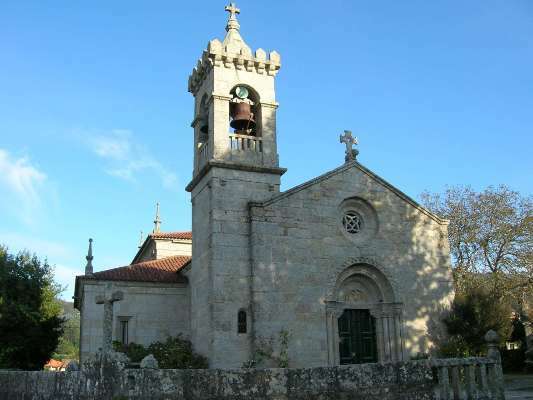 Samieira is a small parish situated on the north coast of the picturesque Ría de Pontevedra. The area is popular for walking with one particularly well known route being ‘A Ruta dos Muiños’, a beautiful walk which takes in 23 historic water mills and 3 look-out points offering stunning views of the surrounding countryside.There are a couple of restaurants, bars and small convenience shops in Samieira whilst a wider range of amenities can be found in nearby Sanxenxo. In this area you’ll enjoy easy access to the historic city of Pontevedra, the stunning peninsula of O Grove and the wealth of fantastic beaches which stretch all the way around the Atlantic headland and then along the banks of the Ría. In neighbouring Combarro you’ll find one of Galicia’s most famous picture-postcard views, the line of old hórreos (grain stores) perched along the water’s edge and in the wealth of restaurants and cafés situated behind them you’ll be able to try the maiz empanada for which the village is also known. Negreira is a charming town that sits in the valley of the Tambre River which connects the interior parishes of the region with the coast at Noia. Having long been a place of refuge for pilgrims on the Finisterre route of the Camino de Santiago, there are still two 'refugios' which welcome weary travellers to this day. You’ll find all amenities and a range of shops, supermarkets, bars and restaurants throughout the buzzy streets in what is very much a typical working town and somewhere to truly experience everyday Galician life. Rich in history and surrounded by some breathtakingly beautiful countryside, Negreira is ideally situated just a short distance from the spectacular city and UNESCO world heritage site of Santiago de Compostela and within easy reach of the stunning coastline that extends outwards from the Ría de Muros e Noia, providing a great base from which to explore this enchanting area of the Rías Baixas. The typically Galician cluster of pretty stone houses that make up the hamlet of Hio sit at the gateway to some of the most stunningly unspoilt beaches we have discovered in this southern corner of Galicia. 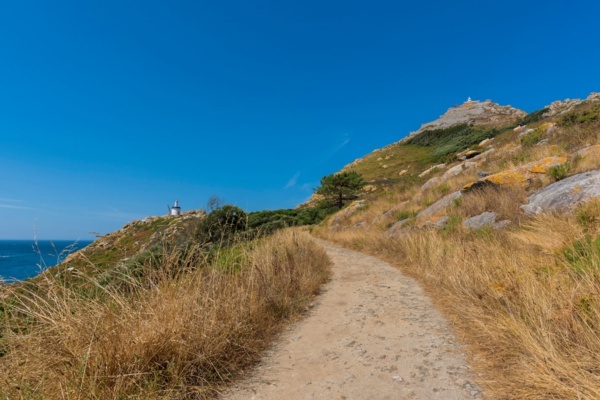 From the ancient stone cross that marks its centre, a country road winds its way past the local café and some excellent restaurants before heading out along the coast towards the headland at the tip of the Morrazo peninsula. Here, amidst a picturesque patchwork of vineyards and meadows, narrow lanes lead off the road to the water’s edge where Caribbean-like white sands fringe sheltered bays and provide idyllic settings from which to watch the fishermen as they navigate their boats between the mussel beds. 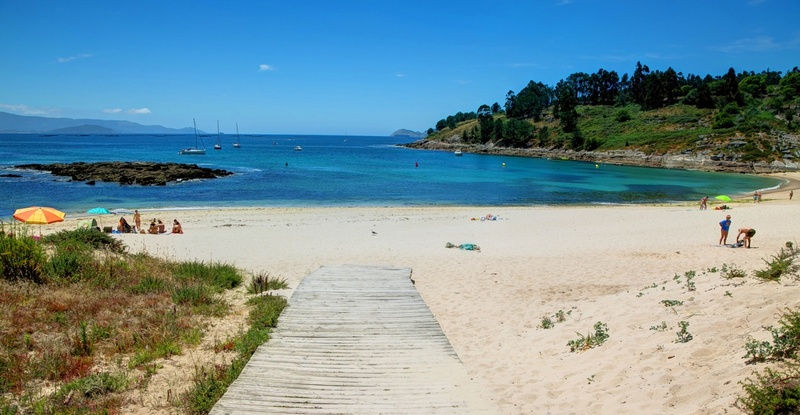 At almost 2km long, this is one of Galicia’s most emblematic and popular beaches. Awarded Blue Flag status every year, the beach has fantastic facilities and is backed by an array of bars and restaurants which all serve up fabulous fish and seafood fresh from the waters all around the coast. 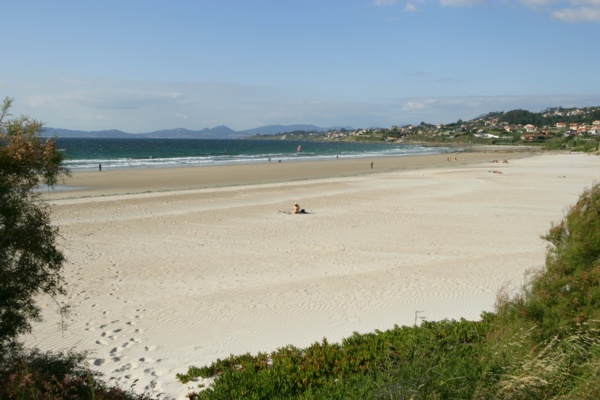 The beach is situated in Nigrán which enjoys a privileged coastal location between Vigo and Baiona. 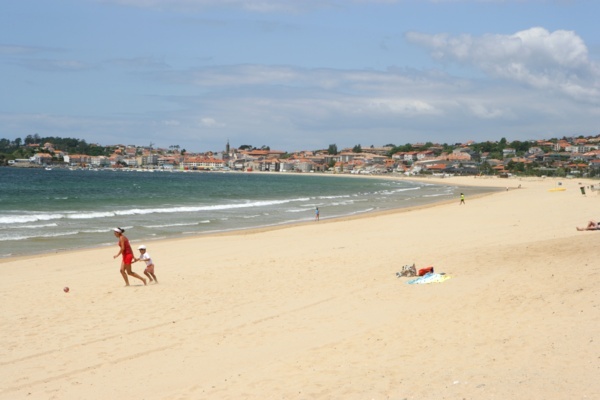 The area is home to an array of fine sandy beaches, traditional fishing villages and a number of beautiful old ‘Pazos’ (noble houses), reminders of a prosperous period of economic growth which took place in the Middle Ages due to the rise of a number of important commercial centres in the region thanks to their enviable Atlantic-facing positions on the Ría de Vigo. Panxón is a charming traditional fishing village situated in the municipality of Nigrán. It has a small, buzzy port which is backed by a variety of restaurants all serving delicious, freshly-caught fish and seafood. The port sits at one end of a fine sandy beach, which is an extension of the area’s most famous beach, Playa América. Panxón’s bay with its soft sand and tranquil clear waters is protected from northerly winds by Monteferro, a forested peninsula which is home to a great variety of flora and fauna and offers stunning coastal views. Panxón is situated in the municipality of Nigrán which is most famous for its fabulous beaches, historic fishing villages and fine noble houses (Pazos), which are testament to a golden age of economic expansion that took place in the region owed to the success of many of its Atlantic-facing ports which became important commercial centres in the Middle Ages. Seen by many as the jewel in the Galician crown, Santiago de Compostela is a beautiful city steeped in history. 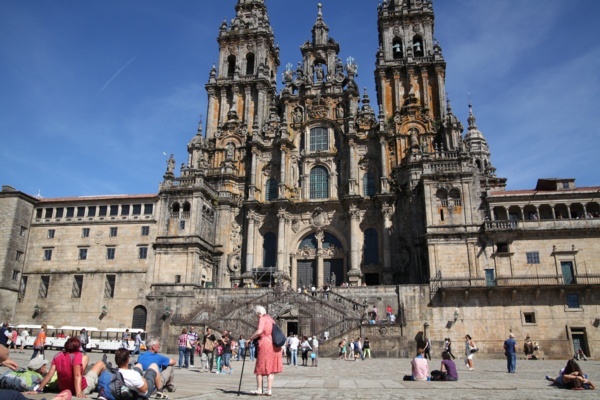 Its ancient streets have welcomed weary pilgrims for centuries and devoted travellers on the famous Camino de Santiago are rewarded with what must be one of the most breath-taking views in the entire Iberian Peninsula; the stunning cathedral façade stood over the Praza do Obradoiro. Being a university centre, the streets and bars buzz with a youthful energy and the narrow streets are lined with boutique shops, bars and restaurants. The city is also home to many parks and the relatively small historic centre makes it easily navigable on foot.